These lamps are dramatic and gorgeous! I had to reorder as one of the lamps arrived damaged. The large glass panels came apart and it appeared they were not properly glued. I called Overstock and they quickly sent another set. Again, one was slightly damaged although this time, the top glass panel was not glued - something I could have easily fixed, myself. Luckily, I still had the first shipment, so I returned the two damaged lamps. Although it was inconvenient to make the return, Overstock provided exceptional customer service and the lamps are more than worth it. Trust me when I say you will not find lamps this nice, at this price, anywhere else. I would purchase these again and again, because the customer service Overstock provides is top notch! 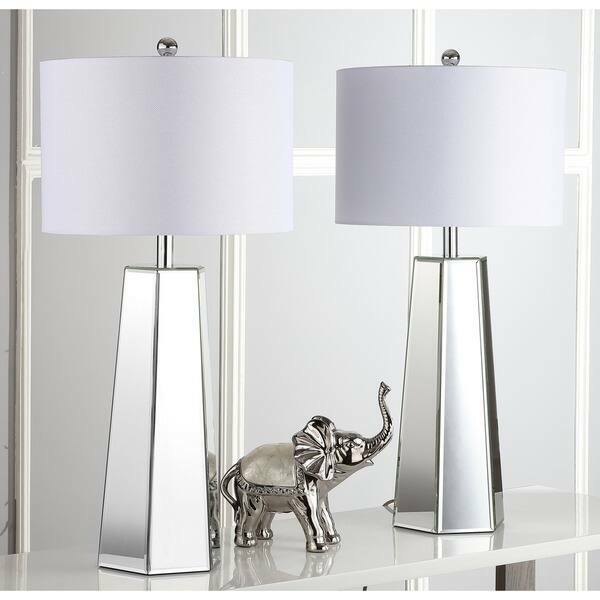 If you are looking for a set of large table lamps that are a statement piece, then this set is the one. Designed to reflect the extravagant style of the boudoirs of Old Hollywood s grand dames, this traditional mirror table lamp (set of 2) is a classic. Paired with chic chrome detail, it reflects flattering, diffused light through its crisp off-white shade. Beautiful lamps. I was dreading the thought of putting the lamps together, but it only took me about 15 minutes for both. And the bulbs are included. The base of these lamps are mirror so they reflect a lot of light. I love the height, over 31 inches tall. The shade is white and looks like linen. I would definitely buy them again. Love, love, love this lamps. I have been looking for them ever since I saw them at *** each. They were slightly bigger but no way was I paying *** or 2 lamps. These are perfect, easy to assemble and so beautiful. OMG!!! These pair of mirrored lamps are to die for. So elegant looking and well made. It was packaged really nice so everything is intact. It gives off good lighting at night. The height of the lamps are substantial. Much bigger than I expected which was a bonus coz they really command attention in the room. And the shades are crispy white so it looks very clean, elegant yet very urban. Now I’m obsessed with everything mirrored. I love the style of these lamps. They are a great fit in my home. I will definitely recommend and they are packaged perfectly. The lamps are bigger than I initially thought, or at least what they appear in pictures. They are very well built and can add a lot of character to a room. They are also very reasonably priced. They were packaged really well and had no issues with the delivery. I would recommend this item. Very elegant and sophisticated table lamp. I loved them. It was the perfect size. If you are looking for a tall table lamp this is a very good choice. The perfect balance between the mirror and the white shade. These lamps are so beautiful in person. Their big and more elegant than I expected. Came fast and very well protected. I definitely recommend these! The picture does these lamps no justice. They are beautiful very chic looking. As pictured, the glass top of the lamp wasn’t glued straight and the other lamp had a small crack which is pretty annoying since these weren’t the cheapest lamps. Also the off-white is almost a grey which is also disappointing. 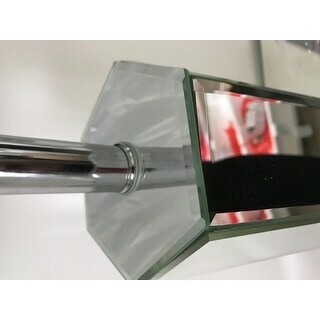 The mirrored glass base is nice though I will say. 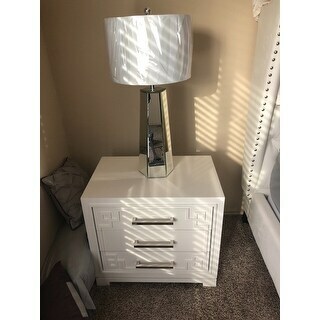 Nice lamp and it shipped fast. They had put the two lamps together in one big box. I unpacked it and started to put the first one together. Looks beautiful. When I opened the second one and ready to assemble, I saw that it was cracked on top of the lamp post. The lamps are all mirrored, therefore it’s extremely fragile. I’m not sure why Safavieh decides to cram two mirrored lamps together (it was packaged nicely, but not enough when it’s a super fragile piece like this). I gave it 3-stars because Overstock’s customer service was so superb! (Otherwise this item would’ve been a 1- star for me). Love overstock!! These lamps are amazing! They arrived perfectly packed. The mirror makes them look great. I was so excited to receive them for my bedroom. Safavieh never disappoints. Love them! These lamps are absolutely beautiful! Easy to assemble. Love them! 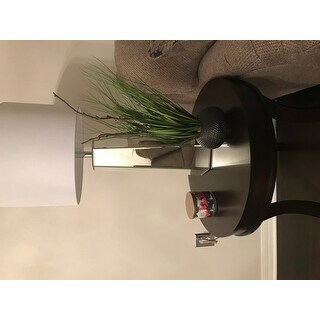 I bought these for my daughter who has a “Hollywood Glam” look bedroom and they are on mirrored end tables. They are so divine that I want to order another pair for my bedroom at home but it means changing out my furniture. I may just do it. These are definitely a statement. They are tall and gorgeous. The pyramid shape makes them stand out and I could not believe the price. Amazing! The lamps are beautiful!! Easy to put together. I had a problem with a damaged lampshade but your customer service goes above and beyond!! Thank you Overstock!! I love these lamps because they are tall, just the right beside height for me. You get the pair of lamps, and they are packaged carefully. The lamp shades are a crisp white and the mirrored base has just the right touch of elegance and bling! "Where do I find that chrome elephant in the picture?" 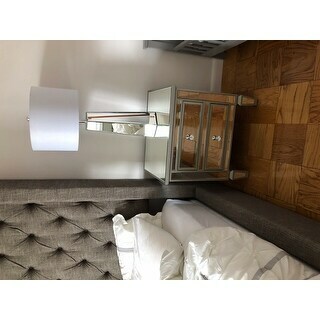 Needed 2 lamps that were tall to compliment my mirrored console table. "does the price include 2 lamps? and where it has quantity do you leave as 1 for a set?" "Are these lamps made of mirrors or are they polished chrome? Thank you." The body type is a mirror with a chrome neck. Polished chrome. Very expensive in appearance and very beautiful! Safavieh Lighting 38.125-inch Myrtle Clear/ Off-White Table Lamp (Set of 2) - 17" x 17" x 38.125"